The latest edition of the Mensch Report offers tips on how to avoid scams and identity theft. Pennsylvania’s older population makes it a prime target for scams aimed at senior citizens. But there are several steps all of us can take to avoid being a victim. I highlight them in this report. I hope you take a few minutes to view it. 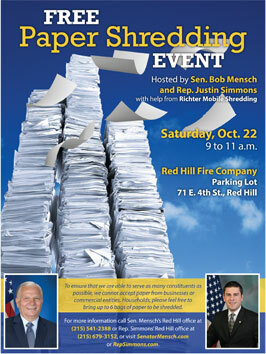 Constituents are invited to attend a free paper shredding event that I am hosting with State Representative Justin Simmons on Saturday, October 22 from 9 a.m. to 11 a.m. at the Red Hill Fire Company Parking lot located at 71 East Fourth Street, Red Hill, PA. Richter Mobile Shredding will be providing the service for constituents. To ensure that we are able to serve as many constituents as possible, we cannot accept paper from businesses or commercial entities. Households are welcome to bring up to 6 bags of paper to be shredded. For more information, call my office at 215-541-2388 or Representative Simmons’ office at 215-679-3152. You can also visit our websites at www.senatormensch.com or www.repsimmons.com. Veterans are invited to attend my annual Veterans Appreciation Breakfast which will be held on Saturday, November 12, 2016. Doors open at 7:45 a.m. for check-in and the event will take place from 8:30 a.m.-10:45 a.m. at the Upper Perkiomen High School, located at Two Walt Road, Pennsburg, PA 18073. Veterans must register themselves and up to one guest by Monday, November 7. Veterans can register by calling 215-541-2388 or by completing the registration form online. Montgomery and Bucks County residents can bring their license and a copy of their DD214 to receive a Veterans Photo ID card which enables them to access discounts from businesses in their respective counties. Berks County residents can obtain information on how to obtain a Veteran Photo ID card from the Berks County Recorder of Deeds by calling their office directly. The new “Share the Road” special fund registration plate designed to help fund bicycle safety is now in stock and being shipped to interested vehicle owners, PennDOT announced today. The new plates were authorized by Act 36, referred to as the David (Dave) Bachman Act, which was enacted in June in memory of a PennDOT employee who served as the Department’s first Bicycle/Pedestrian Coordinator. All proceeds from the sale of the new plate fund PennDOT’s bicycle and pedestrian safety efforts, as well as highway infrastructure signage for bicyclists with the purpose of wayfinding and/or safety. Applicants may order a plate by completing Form MV-917, “Application for Share the Road Registration Plate.” The cost of the plate is $40. This plate may also be personalized for a fee of $100 in addition to the $40 plate cost. Customers may also place an order for this plate or learn more about a wide variety of license plates, online. The plates normally take two to four weeks for delivery. For personalized plates, allow eight to 10 weeks for delivery. The second annual Pennsylvania Manufacturing Week is underway. The week is designed to showcase our state's diverse manufacturing industry, work on changing people's perceptions of manufacturing today, draw attention to the amazing career opportunities available, and educate the public on the industry's significant impact on the economy. View the upcoming events here. TriCounty Community Network’s (TCN) mission is to engage community stakeholders through service integration, advocacy, training and support. One key service TCN offers is their mobile job lab. 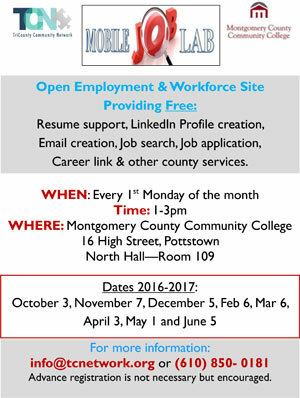 The mobile job lab is held every 1st Monday of the month from 1-3 p.m. at Montgomery County Community College located at 16 High Street, Pottstown, PA in the North Hall (Room 109). Attendees can access resume support, email creation, job search assistance, and more. For more information on the mobile job lab, upcoming dates, and to register for the job lab, email info@tcnetwork.org or call 610-850-0181. What is an Autism Diagnostic Evaluation? The Autism Diagnostic Observation Schedule (ADOS-2) is a semi-structured, standardized assessment of communication, social interaction, play, and behaviors providing accurate assessment and diagnosis. This assessment is available to children and adolescents of differing developmental levels and language skills suspected of having autism or other developmental disorders. The evaluation consists of five modules; our licensed psychologist will select the appropriate module based on the age and language skills of the child/adolescent. The assessment includes a series of standardized activities involving interaction between the child/adolescent and licensed psychologist where the occurrence or non-occurrence of behaviors are observed. The assessment requires 40-60 minutes to administer in addition to a family interview prior to the assessment. A report will be provided confirming diagnosis with a recommendation of services. To make an appointment for an Autism Diagnostic Evaluation, please call our Family Autism Center at 267-404-5988.